The cover story of the latest issue of the Film Noir Foundation’s magazine is a certifiable corker. Back in April, the FNF bestowed its second Modern Master Award on novelist James Ellroy in advance of a screening of the Oscar-winning masterpiece based on his novel L.A. Confidential. Included in the magazine is a transcript of his wild, jaw-dropping conversation with FNF honcho and master of ceremonies Eddie Muller. Trust me, you’re going to want to read this one. ASIDE: don’t sleep on the latest work from the recipient of the inaugural Modern Master Award, director Stephen Frears. A Very English Scandal, written by Doctor Who’s Russell T. Davies and boasting sterling work from Ben Whishaw and a career-best Hugh Grant, is now streaming on Amazon Prime. Frears is still throwing heat at age 77. That’s the kind of person we honor at the FNF. Elsewhere this issue, we’ve got the redoubtable Ray Banks on Britain’s first neo-noir Nowhere to Go (starring Maggie Smith! ); Eddie Muller on the silent Japanese proto-noir Policeman (1933); an appraisal of forgotten Swedish master Hasse Ekman by Imogen Sara Smith; Farran Smith Nehme in conversation with Michael Curtiz biographer and Noir City stalwart Alan K. Rode; Jake Hinkson with some summer reading on the beach in noir; and much more. Still, I know what you’re thinking. What about you, Vince? What did you do this time around? I’ve got a feature on Baby Monkey, Private Eye, a gorgeous first reader for children written by Brian Selznick—whose previous books have been turned into films by Martin Scorsese and Todd Haynes—and David Serlin. My conversation with these two gentlemen was an absolute joy, and I hope some of the fun comes across in the article. Plus I’ve contributed a troika of book reviews—on Thomas Doherty’s essential work of scholarship Show Trial: Hollywood, HUAC, and the Birth of the Blacklist; J. E. Smyth’s eye-opening Nobody’s Girl Friday: The Women Who Ran Hollywood (Edith Head warrants her own chapter, natch); and a newly annotated edition of Chandler’s The Big Sleep—plus hot-off-the-presses hot takes on films from the Seattle International Film Festival including one of the year’s best movies, Denmark’s The Guilty. This installment of my Cocktails & Crime column includes an interview with Abigail Gullo, who’s put her acclaimed bartending skills to work creating a drink named for Joan Crawford’s crowning achievement Mildred Pierce. Don’t miss out. 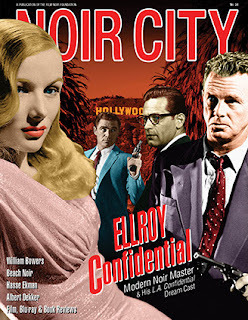 Donate to the Film Noir Foundation to have this bounty delivered to your digital doorstep. The Demon Dog says so.